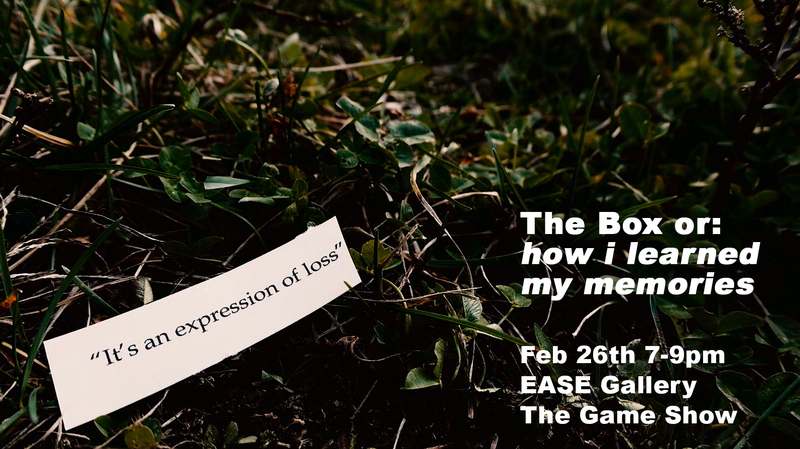 Debuting February 26th from 7-9pm and then continuing to show through April at Ease Gallery, The Box is a new moving image work that I created as part of a five month long collaboration project. The piece, The Box or: how i learned my memories, is a 14 minute experimental narrative piece that utilizes Super 35mm, digital video, and digital audio recordings to be displayed on a single channel display along with a sound dome. The piece features audio, text and artworks from my collaboration with writer Karl Stevens, and designer, Julie Jent. Featured in the film is Nicolette Swift and Matt Yoho. E.A.S.E. is a nonprofit gallery dedicated to providing an inclusive space for artists to experiment, explore, and engage with the public through exhibitions, educational programming, and more. Visit facebook to stay up to date on the opening.